Come to the beautiful land of Africa and enjoy the wildlife here. Visit Savuti the beautiful land filled with the greatest delights and the ideal travel destination in this part of the world. A major game viewing area this is also called Savuti and spans over 1930 square miles. Lying to the south west of the Chobe National Park, this is surrounded by the Magwikhwe sand ridge. This is around 156 miles long and around 65 feet high. This is actually the ancient shoreline of a lake that spread over the northern part of Botswana. It is really unimaginable how this dry land was actually a part of a region that was below an inland sea. The River Linyanti is said to have fed the land earlier and today the dry Savuti Marsh is a great part of the Mababe Depression and is the only region that has had water getting filled in the recent past. This marsh is very mystical and is famous as it has the capacity to dry up or get flooded irrespective of rains. It is also said that David Livingstone crossed this region when he went on to discover the Victoria Falls in the year 1851. A channel from the Linyanti River once fed the now dry Savuti Marsh, which is the deepest part of the Mababe Depression and is the only part to have filled with water in recent history. The region started to totally dry up sometime in the year 1888 and remained thus till 1957. the major vegetation here are the camel thorn acacia trees which grew to full size here. the trees got drowned during the time the entire land got flooded and these dead trees were a major feature of this region for a long time to come. Today Savuti is a lovely desert like region with the sun blazing down on the hot sand. The other end has lovely luscious grass plains with a lot of wild animals and it resembles the Serengeti region of Tanzania. The rich grasslands grow a great deal during the rains in summer thus giving us the best sights of zebras which migrate from the Linyanti to graze here. Savuti has a lot of pans that hold water for a long time thus giving the wild animals here a continuous supply of water. The Gubattsa Hills are another major feature of the Savuti region. These are said to have developed around 980 million years ago during the time there was a volcanic movement here. These rocks are dolomites and they have resulted in the creation of innumerable hills. Rising to a height of a round 290 feet these really dominate the landscape here. The Savuti region has a good population of wild dogs which are fantastic African hunters today. There is a great population of lions too along with cheetah and leopards. Hyenas are also seen to live here a great deal and are considered to be formidable hunters in this part of the world. Savuti also has some of the best kinds of wild elephants which get good fodder here. 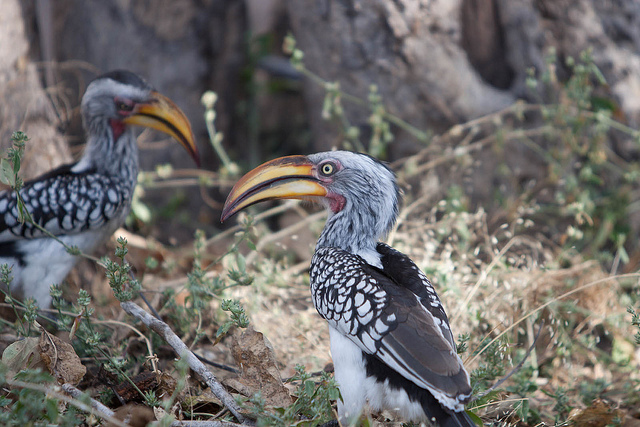 Birds in Savuti abound in various varieties. So you get to see the kori bustards and the secretary birds alongwith the redbilled francolins and the Abdim’s stork. The redbilled francolins are popular for their wake up call like sound early morning. Then see the quelea finches and the carmine bee eaters along with the fish eagles. These are some of the best aviary varieties found here. April is the time when you can get to see the best collection of these twittering birds. Rains come here in the months of November to April during which time the animals graze in the green pastures. There are many zebras which migrate from the Linyanti towards the north. Then they move towards Savuti southwards and land in the Mababe depression. In the months of May to October the animals go to the artificial waterholes and the months of September to October is the time game viewing is popular. Predators are much seen occupying the waterholes. Wild dogs and sage bush are a special attraction in Savuti. With all this in tow, tourists love to come to Savuti and enjoy the pleasures of a different wild kind. Visit Savuti in Africa and enjoy the travel delights in this part of the world.